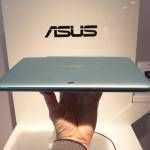 The tablet weighs just 590 grams which is lighter than the Surface 3 but also a bit smaller. 10.1 inches compared to 10.8 inches on the Surface 3. The keyboard is chicklet-style which means overall thickness is greater than with a Surface 3 and Type Cover keyboard but then you’re paying a lot more for the Surface 3 and the keyboard on that isn’t what a lot of people would hope for. Taking a look at the performance it looks like the Atom Z3775 CPU keeps up with the Atom X7 on the Surface 3 but falls behind in graphics performance. For those of you thinking about Minecraft on the go you need to be looking at Atom X5 and X7 because the Baytrail-M GPU just isn’t up to anything more than Windows Store gaming. In general usage the T100 Chi should feel quite snappy up until the 2 GB RAM is used up and it starts to use a disk-based Pagefile. At that point you will need to close down apps / tabs or background processes. This 2 GB limit is, as with most of the low-cost consumer Windows tablets, something to consider if you’re looking at barrier-free office usage. See the Top 10 mobile PCs here. Battery life reports seem to be good with web-browsing figures coming in at over 9 hours. That’s good for a 30 Wh battery but do note that the screen has a high maximum backlight brightness. While that’s generally good, it does mean you can run the battery down quickly if you’re turned of adaptive brightness settings and are running with high brightness. 5-6 hours productivity looks easily possible. 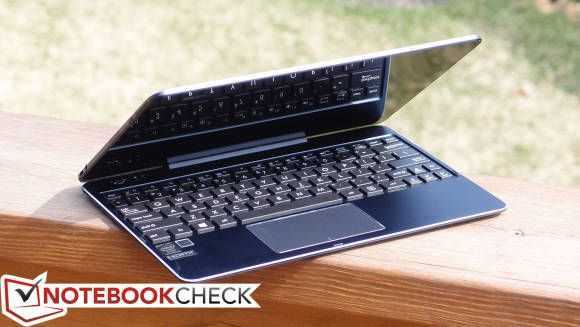 The ASUS Transformer Book T100 Chi doesn’t have AC WiFi or a keyboard backlight and there are no connections on the Bluetooth keyboard. 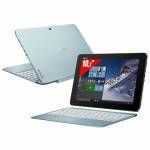 You’ll also have to charge the keyboard separately from the tablet which I’m sure will catch a few people out. There’s no stand either so you can’t separate the keyboard and tablet like you can with the Acer Switch 12. It runs a 32-bit version of Windows (which indicates a 32-bit bootloader that won’t work well with many Linux distro’s) and there’s no 4GB RAM option as on the Surface 3. It’s these limitations that you’ll have to remember as you excite yourself over the $399 price but in the 10-inch detachable space it’s up there are my number 1 choice right now. 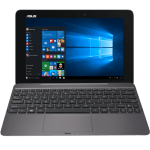 You can find links to more reviews, specifications, pricing and alternatives on the ASUS Transformer Book T100 Chi information page. Feel free to add your experiences in the comments section there too. Now I’d like to see a manufacturer include a backlit keyboard and a greater tilt angle. This Transformer is wonderfully thin and comfortable in the hands, but when attached to the keyboard tilts to a maximum of 10 or 15 degrees beyond vertical. That’s not disastrous, but a greater tilt angle would make it much nicer to use on one’s lap, to mention one scenario. (I’d like to see tilt angle mentioned in reviews more often…I only see it occasionally.) I suppose they didn’t want it falling over the way the Acer Switch 10 does, but I’d gladly trade a few extra ounces of keyboard for increased tilt angle. The Surface 3 checks almost every box, but the floppy keyboard doesn’t work in some situations. You’d think Microsoft or some other company would sell an optional keyboard with a firm hinge; several companies sell them for the iPad, backlighting included. Perhaps in a year or two we’ll finally see a premium convertible with all these features. We’re getting closer and closer as it is. 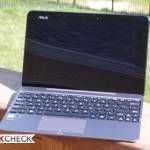 « Chromebooks pushing into India. Will the education sector respond?